!!! NOW ONLY FOR A LIMITED TIME: TOTALLY FREE !!! 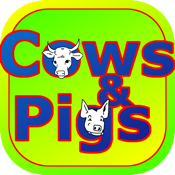 Join the everlasting fight between cows and pigs in this 2 player strategy came. Are you a cow of a pig person? Battle on a modern farm. Conquer as much fields as possible by fencing them in. Fun for all ages. Now with the possibility to start the battle with pre-placed fences. Even more fun! Victory for the Cows! Pigs forever!